I managed to get out a couple of times this weekend and catches were pretty consistent. On day one I had Kip and Bubba on the boat. They were a blast to have around and were on home leave from their oil jobs in nigeria and angola. 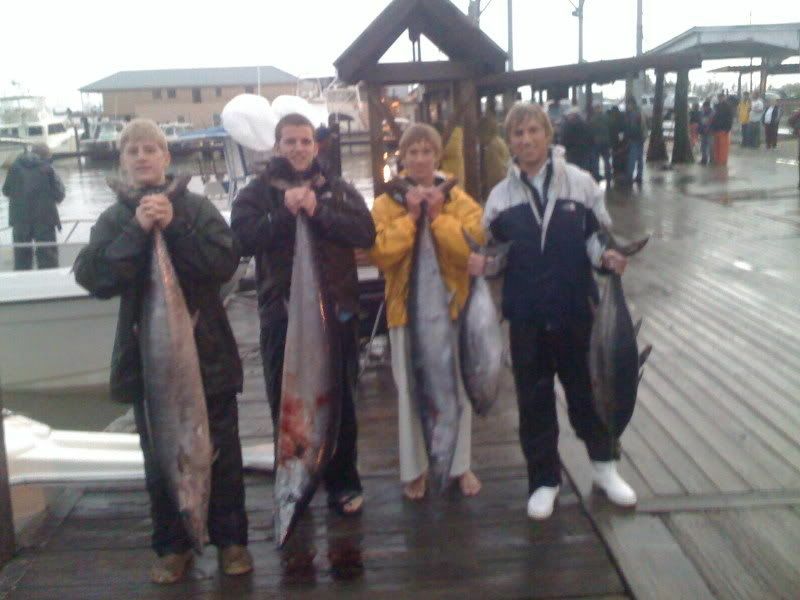 We headed out and found some uncooperative open water tuna. Headed to the first set of rigs and first pass was fish on. It fought like heck and ended up being a 65 pound amberjack. Not exactly what we were looking for but well take it . Next pass was another aj to finish off our limit so we moved on. It was a slow pick the rest of the day but we ended up going 2-4 on wahoo and put three scamps in the boat. We did catch and release about 10 of the ever elusive non existent red snappers while we were scamp fishing. On day two I got a call at 530 in the morning by some guys standing at the dock looking to go fishing. I told them I would be there in 15 minutes and we loaded up and headed out a little late but ready for action. 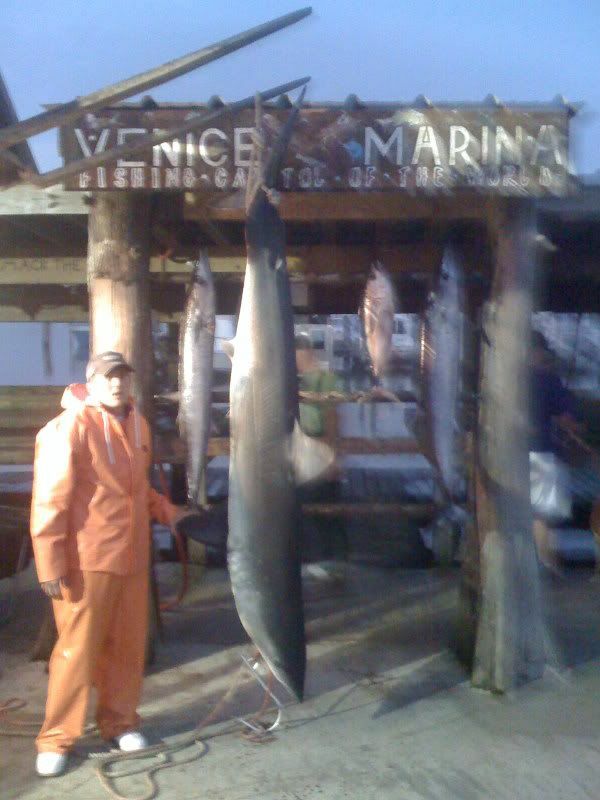 We got one bf in open water and were heading to a set of rigs when the father Tom said look at the shark on the surface. I glanced over and saw a blue dorsal fin and slammed on the breaks and threw some pogies in the water while I looked for my mako rig. found it and cut up a bonito and hooked it on. Fish hit almost instantly and ran off about 100 feet of line and spit the hook. Told Chad to leave the bait out and hopefully he would come back. 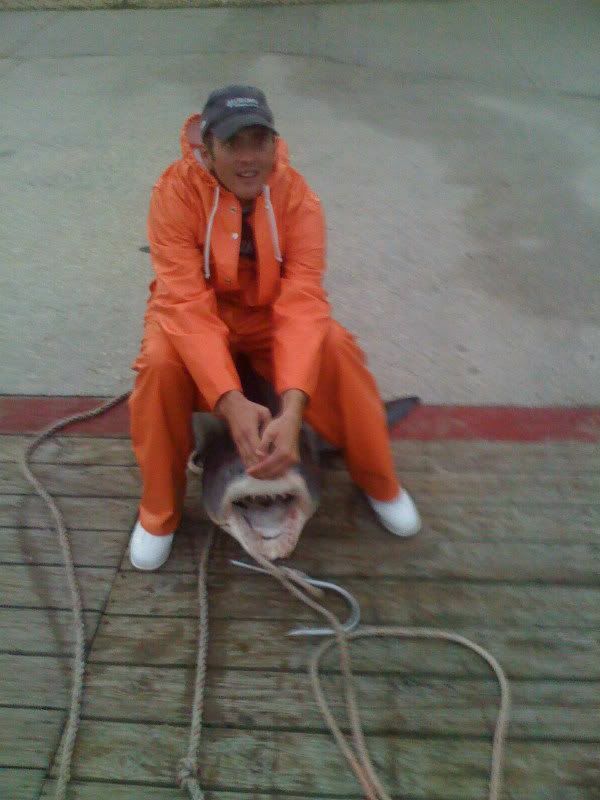 About 5 minutes later we had a NIBBLE or at least what a mako nibble feels like and came tight on the fish. It never did fight that hard or make a jump and we had it to the boat about 30 minutes later. I had borrowed Will Walls flying gaff during the fight and was ready to stick it in. got the fish up one last time and Stuck it hard through the side. And then it went crazy. I yelled to the customer to take the boat out of gear. I thought we were in reverse. We were not. The fish was digging deep and dragging the boat backwards at that point. 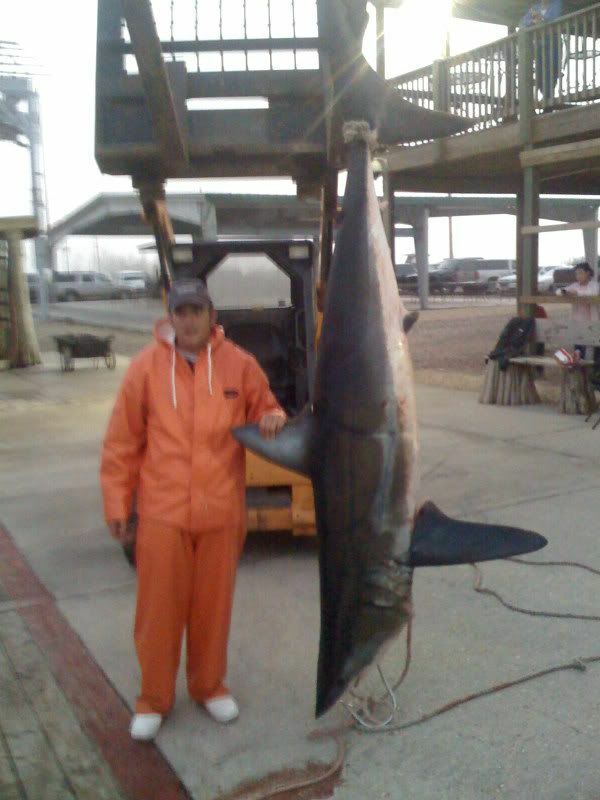 It then came back up at the boat and left me with some good teeth marks on the bill collector. We managed to get a tail rope on him and drug him backwards for a couple hours before it died enough that we felt safe to put him in the boat. We got him tied off on the bow cleat and Chad decided to name him Sam. So we spent the rest of the day fishing for wahoo and asking Sam how he felt. Sam never responded though. We put a couple wahoos in the box and headed to the house with a 350 pound class mako layed across my bow. I had The Lutz family and friends on the boat on saturdayand they were a blast. We chunked for a little while and caught a pair of fat blackfins and then went trolling. 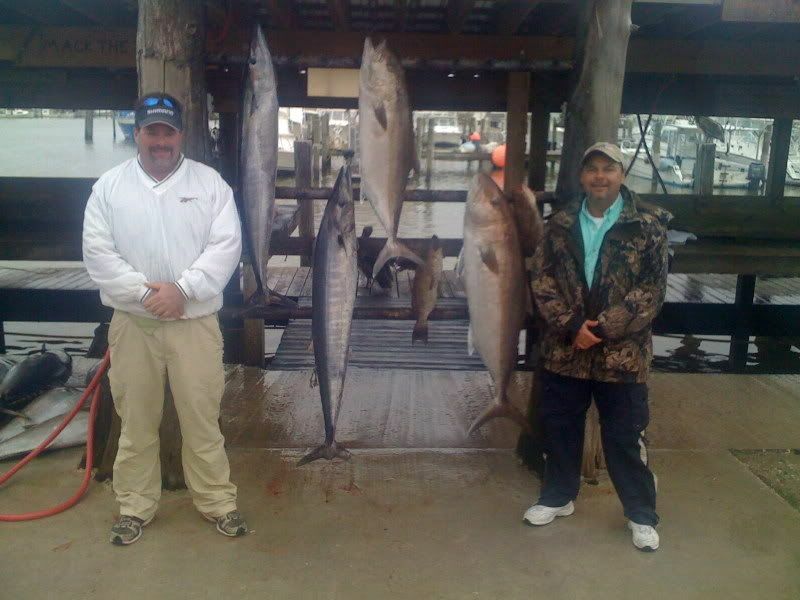 They all caught their biggest wahoo ever with the biggest weighing in at 65 pounds. All the fish bit on bomber baits. 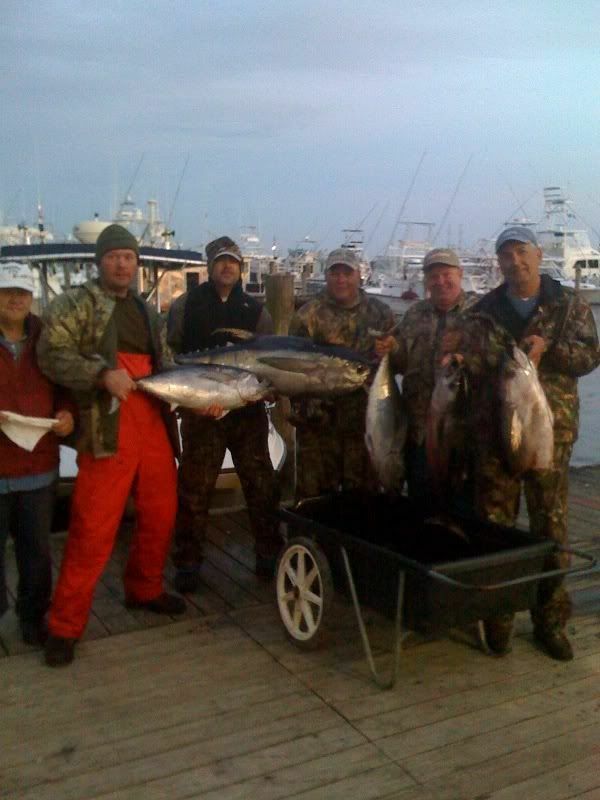 Capt Lee went out yesterday tuna fishing and from what he told me. they got two nice yfs, a handful of blacks and pulled the hooks on a stud at the boat.